Baroness Helena Kennedy QC received a Lifetime Achievement Award in celebration of her 40 years of legal service championing civil liberties and human rights. 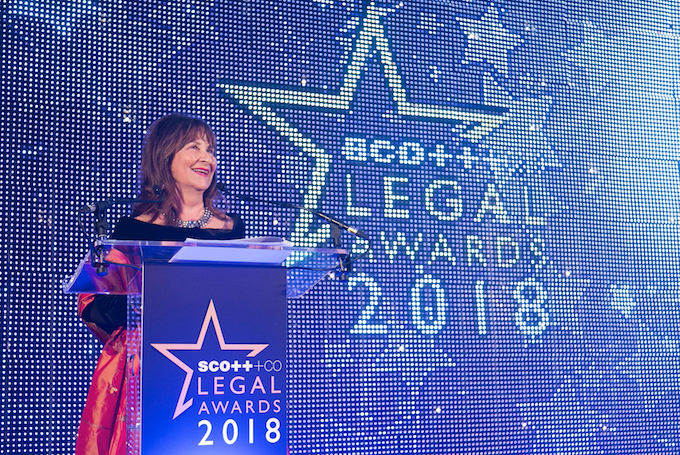 The highly regarded honour is presented each year at the Scott + Co Scottish Legal Awards and Baroness Kennedy accepted the prize at the ceremony attended by a record 450 lawyers in Glasgow where she was born. She was among 17 winning businesses, teams and individuals in the annual competition which rewards the best of Scottish legal practice across the country. The independent programme which launched 15 years ago is decided by a large expert judging panel, chaired by Shonaig Macpherson. She commented: “It’s been another exciting year showing the great diversity, innovation and skill at work every day in the Scottish legal industry. 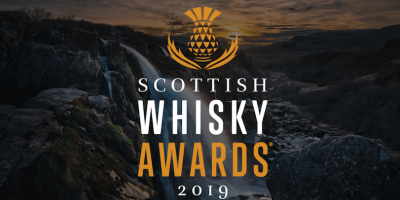 “Alongside my colleagues on the judging panel we have received a large number of detailed entries which have given us great confidence in the sector and in the competition. “The decisions are never easy but we do spend considerable time debating the merits of every entry in detail prior to making a decision. 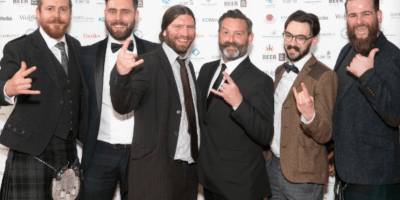 Among the major winners were Digby Brown who won the Scottish Legal Awards Firm of the Year after a year in which they reported high growth figures. The senior leadership award, Managing Partner of the Year, was presented to Malcolm McPherson, Senior Partner of Addleshaw Goddard for his role delivering the full merger of HBJ Gateley into global firm Addleshaw Goddard. The newly combined firm is now ranked 15th in the UK and has over 200 partners and 1100 lawyers. In Scotland, recruitment of legal staff since the merger has increased by 15%. Many individual awards were handed out including the hotly contended Rising Star of the Year, sponsored by Quiver Management to Ruth McColgan of Stirling Council. The Head of the Employment Team at Blackadders, Simon Allison, collected the popular prize for Lawyer of the Year, sponsored by The Law Society of Scotland. The Residential Property Team of the Year, sponsored by Property Searches Scotland, was collected by Edinburgh-based Coulters after delivering a year of strong growth in a range of innovative ways. For strength and depth in a speciality area and delivering excellent growth. For overseeing the full merger of HBJ Gateley into Addleshaw Goddard in June 2017 creating a newly combined UK firm ranked 15th in the UK. Recruitment of legal staff since the merger has increased by 15%. Digby Brown – for high value fundraising and significant time donations. For a stand out submission showing global experience and a team driven by great leadership. For a significant legal win at appeal marking a worldwide first for Scotland.